1 Day Hike in the Mala Fatra mountains. The program depends on your requests and hiking level. The price is 65 € / person. Discount is available for 3 and more participants. Look at the further information below. All about the Day Hike in Mala Fatra. Do you like nature and hiking, but you only have a day for a hike? No problem. 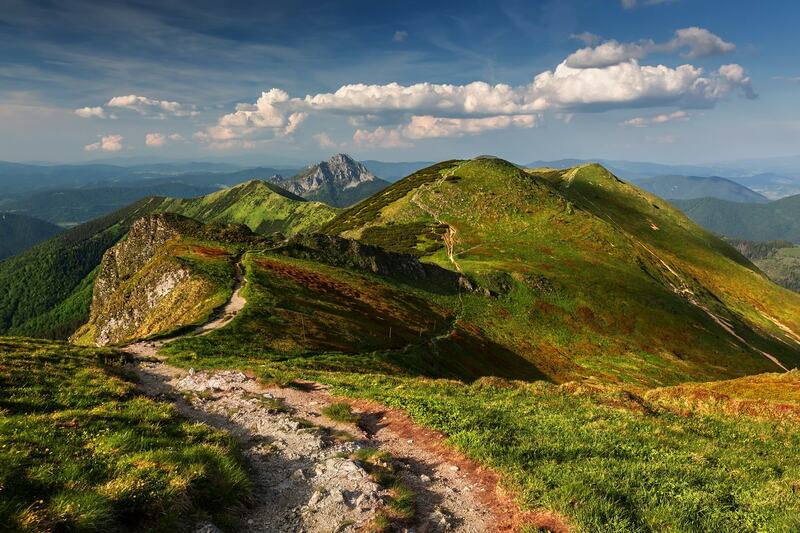 The Small Fatra offers wide variety of hikes for every level. It´s up to you whether you want to take it easy, or challenge yourself a little bit. We can walk through the famous Janošikove diery gorge. We can ascent to one of the most beautiful peaks – the Velky Rozsutec. If you would like to save the energy, we can take the cable car up to the mountain ridge, walk to the highest peak of the Small Fatra and visit the traditional mountain hut for a lunch. There are endless possibilities and the program really depends on your requests. We will speak about the program after reaching us. 1 Day Tours are primarily intended for visitors of the north-west Slovakia, e.g. the towns of Žilina, Trenčín and the surroundings. But nothing is impossible, so don´t hesitate to contact us, even if you are visiting the different part of Slovakia. Your day would have to start early. You will need to get on the train in Bratislava either at 6:13 or latest 7:13 in the morning and get off the train in the town of Zilina. The train goes in direction Kosice. We will meet you at the train station either at 8:40 or 9:40, depending on the train you take. Just let us know, which train you prefer. You don´t have to necessarily book the the tickets back to Bratislava, but if you insist, it should be after 16:00 or later. We will tell you the program, after you tell us your requests and wishes. This is 1 Day tour. There is not an accommodation provided. What clothes do we need to wear?Where do we meet? What clothes do we need to wear? It depends on the difficulty and type of the hike. In general, it´s recommended to have a pair of waterproof hiking boots. The hiking boots are essential. The hiking clothes as a waterproof jacket or waterproof coat are recommended, because the weather can change during the day. You will also need a day pack for extra clothes, water or some snacks to eat. We will meet in front of the place where you stay (hotel, hostel) or on a train station in the town Žilina or on a different place after an agreement. Wonderful experience with Slovakation! Myself and two friends had limited time in Slovakia but hoped to fit in a one-day hike. We had trouble finding any leads in Bratislava, but thankfully contacted Martin about his day trips to Mala Fatra National Park from Zilina. Martin helped us organize our trains and led us through a stunning hike that fit perfectly within our tight time frame. He is a knowledgeable, friendly and awesome guide who went above and beyond for us. Would highly recommend for short or longer hikes! My experience with Slovakation and Martin was nothing short of incredible! Some friends and I were staying in Bratislava for only a few days but really wanted to squeeze a hike in -- but we found it difficult to find options for shorter hikes. We then found Slovakation online and Martin made it all happen for us. From the start, he was accommodating, helpful, and flexible in planning our hike. He helped us make arrangements to train in from Bratislava to meet him in Zilina and we had an excellent 1-day hike up Mala Fatra -- an absolutely breathtaking hike. He was a very knowledgeable and friendly guide who exceeded our expectations in every way and allowed us to have an unforgettable hiking day in Slovakia! After having trouble finding a one day hiking trip in the Slovakian mountains, I stumbled upon Slovakation. Within one hour, we had scheduled a one day trip for the very next day. Our tour guide, Martin, led myself and 2 friends through Mala Fatra for a 5 hour hike. We had travelled from Bratislava to Zilina and it the entire experience was fantastic. The hike was incredible. We were guided up the mountain and Martin provided information about the area along the way. We were able to see some amazing views and get some good pictures. I would highly recommend this tour company to anyone interested in hiking and seeing something new. Martin was very helpful in planning our trip and ensured that we were able to make the trip without issue.